Our mission is to bring training in self-defense to those who want to provide a safer environment for themselves and their families. Krav Maga is the official hand-to-hand combat system of the Israeli Defense Forces (I.D.F. ), Israeli Police and Security Services. It is also the preferred system for U.S. Military and law enforcement personnel. 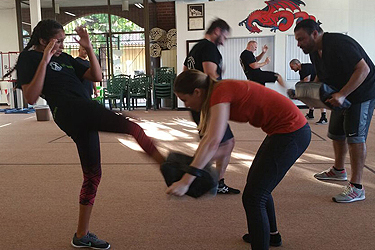 Krav Maga is now known as the best all-around self-defense system and defensive tactics system in the world that is designed specifically to get people to a high level of proficiency in a short amount of time. 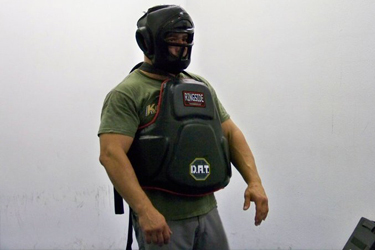 Modern Combat & Survival Training Center in Corona CA, offers Krav Maga for Law Enforcement and Military personnel for Officers, Deputies, and Federal Agencies and Agency Defensive Tactics Instructors. Our goal is for the youth to realize the importance in becoming a successful and accomplished person. Respect, discipline, sportsmanship, and teamwork are woven into our Krav Maga youth program. Based on simple principles and instinctive movements, this reality based system is designed to teach real self-defense in the shortest possible time. We do not promote or condone fighting we believe that one should always be capable of defending themselves when involved with a violent encounter. Training in Krav Maga is an excellent workout. Stress drills are used to simulate real life attacks. Training is done with simulated knives, baseball bats, clubs and guns to teach students how to deal with an armed attacker. Students learn confidence with dealing with attacks, while getting into shape and building strength. Krav maga is the official hand-to-hand combat system of the Israeli defense forces (i.d.f. ), Israeli police and security services. It is also the preferred system for U.S. military and law enforcement personnel. Our mission is to bring training in self-defense to those who want to provide a safer environment for themselves and their families. We do not promote or condone fighting we believe that one should always be capable of defending themselves when involved with a violent encounter. With the ever growing problem of gangs, terrorism and constant threats of violence, we feel that each man, woman and child should be able to defend themselves. Our goal is not to train a person to be a fighter nor bullies, but to train them to be defenders of all that is good. The real deal! Neft, Todd, and Mike are all awesome guys. I believe there's one more instructor but I haven't met him yet. I was looking for a Krav Maga class for a while and went to one in rancho, which was also a nice class just a little too far from my house. Anyway the head instructor Neft is an awesome guy, he makes sure to take time and make you feel very comfortable and know the technique before advancing. When it comes to 80 percent plus of martial arts/self defense training it's a sport where you perfect a technique that is anything but perfect. At Corona Krav Maga you won't learn a sport filled with ineffective techniques, with hard work, you'll learn how to meet violence with violence and be able walk in peace knowing that you will accept nothing less than getting home to your family alive. Where do I start? This place is awesome for those looking to train hard and learn real life combat survival skills. Krav Maga is not a sport; it's a survival system. The Instructor: Nef is the head instructor and provides world class instruction. I have trained with him off and on for a total of about 6 months. He's an excellent coach who knows how to teach anyone ranging from experienced fighters to first timers. I have attended Corona Krav Maga for over 3 years. As a Law Enforcement Officer, I can truly say that this place is the real deal. The instructors Neff, Louis and Todd are very knowledgeable and genuinely care about their students and their safety. Approximately a year ago I moved to another city and had to leave Corona Krav Maga, due to the drive. I tried two other Krav schools, but was very disappointed, since these schools only seem to care about the money, so I returned to Corona Krav Maga. 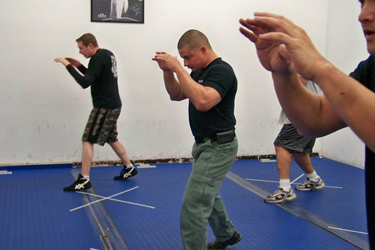 Corona Krav Maga is Law Enforcement friendly and offers a Leo curriculum.